Today I would like to tell you a different way of seeing things, physically speaking, that, well, heap up in other cases and, thus, help you to understand certain aspects of physics, certain problems. I remember while you talk Penrose diagram rather than Penrouse about its censorship hypothesis. Therefore I want to comment on something more important created by this mathematician who both helped physicists, Penrose diagram. I will not go into the study of calculus, which is one of the bases Penrose diagram as complex and can be expressed in coordinate axes R*R (R^2) because I lost. What if I am going to indicate it is that Penrose diagrams is a way of painting in two dimensions (with two axes, the y-axis and the x axis) space and time. Thus, if we take the x axis and the axis as space and as time it allows us to paint as a particle changes its spatial position in time. What I put in the picture. The advantages that this way of representing things are purely mathematical and therefore real life itself. For example, if you remember (I hope) complex and mathematical transformations of the functions of R^2 to R^2, you will remember that there was a kind of transformations called conforming (conformal mapping) that retained the angles and properties. This I have explained to the theme of the round cow for some time and, if not you remember, what you seek. perform transformations of a normal coordinate system to a coordinate system temporary space while retaining the properties and, therefore, facilitating the calculation, over time, of what can happen to a particle. In the diagrams, the axis and, as I said is the time, and the x-axis space. They are only one quadrant, we only (obviously) time can have positive value and space … well. 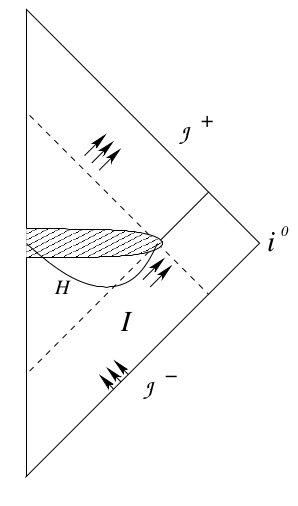 I will not give much grilled on how these diagrams are used for black holes, but I will only affect one thing, that is what I want you to think. Black holes have two important points, the center and the event horizon. The center is where the mass of the black hole, the event horizon is located is the area where, when you arrive, gravity is so great that it can never come out of the hole. So far it’s all simple. Normally we tend to think of a black hole as something round, circular, flat smooth sphere … because we need to have a mental idea, a visual representation of what is. The fact is that it is not. Black holes have no way or, at least, do not know how it is that way. Know why this is thanks to Penrose diagrams are drawn where event horizons. I will not go on their behalf because it is boring and is the representation of various light rays entering and escape the event horizon and therefore the black hole. The only thing I want to clarify is that the event horizon is not a physical site, it is a temporary site, a place in time, like the black hole itself. Let’s see why. General relativity we know that mass warps space and time, to more serious (for the above) time passes more slowly. 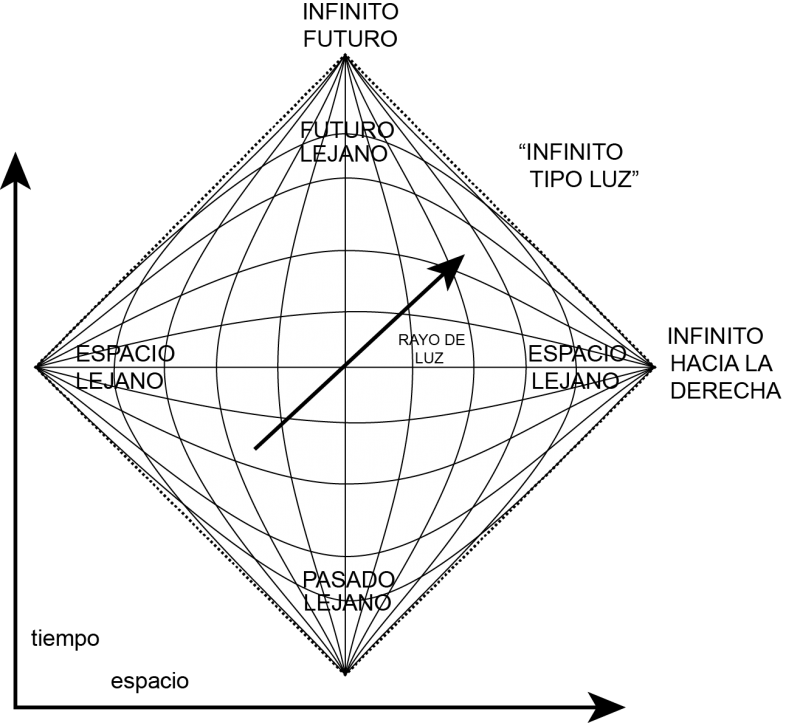 In a Penrose diagram this time speed does not influence because time is ticking and remains the same axis … else it is like, through the x axis, the space, the element moves, but, for example, the light will continue moving the same, then it not affected by time. When a ray of light approaches the event horizon, it moves through space, by axis X of our diagram, but when it reaches the event horizon, in time, is stopped. That is, the event horizon is not located in any particular space but is temporary, is in a defined time. The same applies to the uniqueness that is the center of the hole. If we could see lightning and develops into the hole would obtain, the center of the same, exactly the same problem with the event horizon. It has no form, it is time, the time it takes to reach the center. In fact, for us observers outside, we can only know that approaches the event horizon because the light turns red because gravity causes change the energy and therefore the wavelength of light, being, red, the least of all. So do not think many phenomena of physics as something that happens at one point, but rather, something that happens at a particular time. This, which helps Penrose diagram is a very important stage, especially if we talk about the information it contains. Hawkings (and his group) are developing the equations that tell us about the various theories of relativity doing foot inca time and information involved more than in the time space. But here, now, little I can explain why you now, or I understand it well.